First of all, what is oral history? Put simply it is a collection of testimonies by living persons to record their unique life stories. They are not based on gossip, hearsay or rumors. Instead, oral histories are chronicles of direct observations as told by the people who witnessed the events or lived through the experiences being described. They are taken straight from the horse’s mouth so to speak. This can be a great way of capturing the life and times of your family, close friends, community members and associates from their individual, personal perspectives. Each person has a treasure trove of interesting, funny, valuable observations and insights that only they can express. Saving them for future generations to cherish and learn from can make a wonderful gift to leave behind. Moreover it can instill a true appreciate for one’s heritage that mere images in a photo album or listings on a family tree can not. Who are the people in those grainy, old films and faded pictures your great grandparents took? Wouldn’t it be fascinating to read or hear their special stories and musings about growing up back then? Wouldn’t it be a meaningful legacy to record and share your own stories with great great grandchildren yet born? 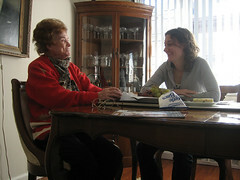 The process for creating a proper oral history is actually quite well defined and disciplined or systematic as the interviewer not only poses questions and records statements, he or she also attempts to verify the facts, put them in an accurate, historical context and store or archive the testimony for posterity. The accuracy of recording history this way of course depends to a large degree on human memory, the spoken word and the honesty of the interviewees. That is why a good oral historian often does independent research to cross reference details against other reliable sources for the purpose of verification. An interview can be conducted long distance over the phone, via e-mail, by video feed on a computer or through traditional written letters. However, as with most forms of one-on-one human communications, it is best done in person. The method of recording living memories can range from taking simple hand-written notes to employing sophisticated audio and video equipment. The most important thing though is the quality of the personal recollections. These can be greatly enhanced by employing proven interviewing techniques that include adequate advance research and developing the right questions to jog the memory and help put interviewees at ease so they feel more comfortable in conveying memories that at times can be about sensitive, personal matters or even painful to recall. In an upcoming Legacy Multimedia blog entry, we will cover in detail the techniques used by professional interviewers to get the best responses from subjects – be they rich and famous or everyday people who are often “camera shy”. What is so interesting about oral histories is that they can never exceed the boundaries of a single human lifetime yet they are often richly textured, entertaining, revealing and timeless. Given their personal nature, the testimonies feel current, honest and relevant at the time they are recorded and if done right, they will maintain a sense of candor and intimacy long after the subject is gone. There is no time like the present to begin the process of creating an oral history for your family and if you decide to embark on this rewarding adventure in personal life-story chronicling, Legacy Multimedia can help. We encourage you to learn more about the process by following the links below and begin while your older loved ones are still available to relate their most interesting, memorable tales. Legacy Multimedia is a proud member of this wonderful organization.